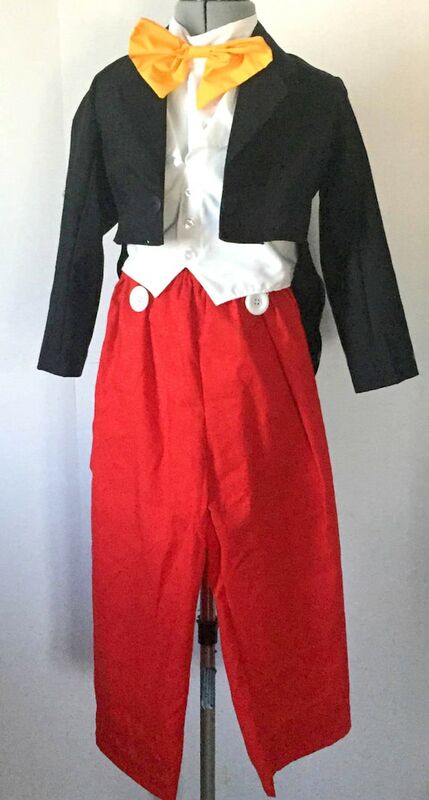 Mickey's tux outfit. This costume is made of a cotton/ poly blend broad cloth. It is soft and pretty easy to wear. the red pants have an elastic waist and big white buttons. The top is made like a dickey (wraps around the neck and ties at the waist. The yellow bot is attached to the top. The tuxedo style jacket has tails and black buttons. Please note that this is a handmade item. Trim may vary from the photo. Also available in adult size, please contact me for more info. I am making these to order so please allow up to 2 week for me to make this for you. If you need it sooner, please contact me before ordering. Please fee free to contact me with any questions. Thanks for looking!